The merit of Shin Godzilla as a film is that it exceeds the genre in remarkable form. That isn’t to say that Shin Godzilla is not in the possession of its own quirks or blemishes. Rather, it is able to spin normally unwieldy attributes to the benefit of the narrative. The main feature of this film is the focus on the human element. Starting as a dark political satire, the focus on the missteps of the Japanese government forms a grim parallel to their response during the Fukushima disaster. The humor is sparse, reserved, and biting; Shin Godzilla holds back no punches from its targets. These people will “move this meeting to a more suitable room” six times in twenty minutes. What little humor is present slowly seeps away as Godzilla becomes a more credible threat. The monster creates an insurmountable amount of damage through his sheer force of being; he is literally radioactive, and his presence is incompatible with the human world. The focus on singular members of the Prime Minister’s cabinet, such as Rando Yaguchi (Hiroko Hasegawa), is a head-fake. They are individually flat characters, because they are each individual facets of the true protagonist: Japan. The film has an uncanny ability to inspire patriotism for a country the audience has never seen. For everything that director Hideaki Anno slams the establishment with, he gives twice as much in praise of the next generation. While the cabinet act cowardly to protect their own positions, Yaguchi and his task force shirk the traditional hierarchy in favor of respect for merit. Through the hope the next generation brings for change and action, Shin Godzilla celebrates the renewed spirit of Japan. The depth in its portrayal of Japan extends to the portrayal of the United States. The US finds itself an integral part of the defense effort against Godzilla; even a giant monster can’t alleviate the restrictions Japan has on its military after World War Two. Through their envoy, Kayoko Ann Patterson (Satomi Ishihara), the audience receives a unique portrayal. While the US is a mostly dependable ally, it is still looking after its own interests during the crisis; they and the senior Japanese officials are more alike than at first glance. The nature of politics pervades Shin Godzilla. Firing a single bullet requires a mountain of paperwork, and public visibility reigns supreme. Contrary to the norm, this only serves to enhance the action. The West Wing-esque maneuverings provide stakes to the havoc Godzilla wreaks as he marches through Tokyo, unstoppable. Because, despite the quality of the political drama, the audience has come to witness the King of the Monsters in all his terrible glory. Anno’s strength as a storyteller is not just his narrative, but in his detailed visuals. Prior work such as Evangelion resonates here in Shin Godzilla, where every frame is set like a painting. It is a distinctly Eastern school of cinematography; the camera pans smoothly and the action is clearly visible. Godzilla is not obscured through shaky camerawork, but rather observed in uninterrupted view. Godzilla is initially portrayed as a stumbling, misshapen beast, to lull the audience into a false sense of security. Even his appearance is lacking for visual detail. However, he soon matures into a truly horrific monstrosity; his night rampage takes its place as Shin Godzilla‘s signature scene. He unleashes all his terrible might and power, his rage and sorrow, in a haunting beautiful moment of pure agony. This scene justifies his name; the audience now knows the awe and apprehension of a man who has challenged the wrath of a god. This is the meaning of true terror. A beautiful orchestral arrangement, from composer Shirō Sagisu, permeates throughout the film. The pairing of a somber string quartet with Tokyo in atomic fire is not intuitive. However, the dissonance adds an ethereal quality to the scene. In that respect, the soundtrack does its job to accentuate the film. Otherwise, it is a beautiful soundtrack crammed into scenes in which the dissonance is not fitting. A hard-rock backing to a discussion in a meeting room doesn’t add the same flair as the above example. The music is darling, but a good director must kill their darlings. As well, there are a few interesting choices in the cinematography during people scenes. Subtitles will show up on-screen to identify every single minor character. Subtitles will also show up on-screen to identify every gun, tank or plane. Sometimes these subtitles will obscure half the screen. As well, there is a frequent tendency to bring the camera extremely close to an actor’s face. These aren’t necessarily bad choices; rather, they’re quirks unique to Japanese cinema that add a distinct flavor. Overall, Shin Godzilla is a far more introspective film than the stereotype holds. It makes for thoughtful viewing that elevates Godzilla to a level he has not occupied since 1954. He is surrounded by political intrigue, and bathed in the atomic fires of his awesome power. Without doubt, the King of the Monsters has never stood taller. 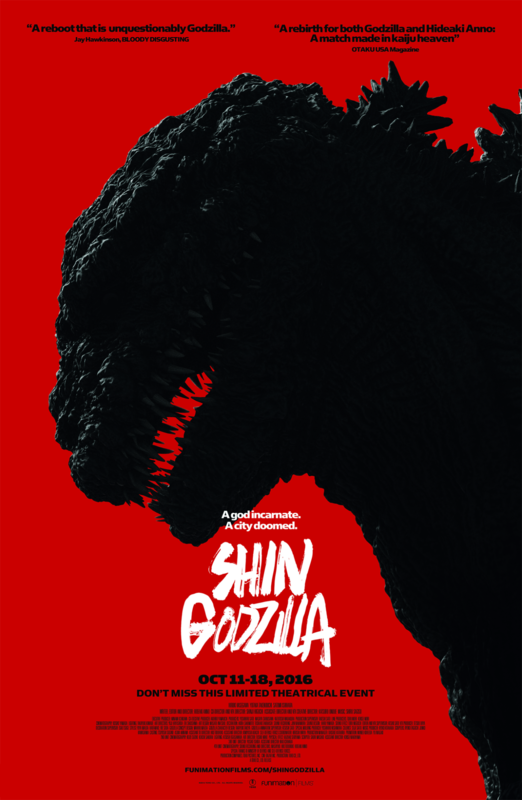 Shin Godzilla continues its theatrical engagement until October 27th, in theaters across North America.